With 1 billion users, and some of the biggest brands joining the network, Instagram can play a major part in marketing your webinars. Instagram is a smartphone-based social network that allows you to publish photos and videos. To use Instagram, you simply need a smartphone and install the Instagram app. You’ll notice that just as other social networks, you can follow people, attract followers, publish photos or video posts and engage with other people’s posts. Instagram also allows you to advertise your content and reach more people through Instagram advertising. Instagram has also introduced “Instagram stories”. Instagram stories is a feature that lets people publish videos and photos that disappear after 24 hours. Unlike your usual Instagram posts, Instagram stories don’t appear in the newsfeed. Instead, they appear in a bar at the top of newsfeeds. To check other people’s Instagram stories, simply click on the home button, and you’ll see at the top, a bar with people’s profile pictures with a colourful ring around them. When you tap the profile picture, their story will be played and the colourful ring will disappear to let you know you’ve watched that story. There are many benefits to using Instagram stories for marketing. First, Instagram stories allow you to convey a more powerful message than standard posts as Instagram stories can be a short clip. Secondly, since Instagram stories disappear after 24 hours, they allow you to avoid cluttering your Instagram profile with marketing messages. If you want to make sure your profile is free of marketing posts and only include your evergreen content and still benefit from using Instagram as a marketing vehicle, then stories is the way to go. Thirdly, because Instagram stories disappear after 24 hours, when you include a call-to-action in your story, there’s a higher sense of urgency for people to follow that call-to-action. Users know that they won’t be able to leave it to later. Another reason why Instagram stories for marketing are beneficial is because since stories are deleted after 24 hours, you can post more frequently without appearing as if you’re over posting. Instagram stories are also powerful marketing tools because you benefit from higher visibility. Regular posts won’t necessarily be seen by all your followers, however, since stories appear right at the top of people’s feeds (which is really key real estate space), your chances of being seen are much higher. Instagram stories also allow you to humanize your brand, as they usually display pictures or clips of the people behind a business, in a raw, un-polished way, and therefore allowing you to connect with your audience at a deeper level. Plus, Instagram stories can be hidden from specific people, allowing you to select who gets to see them. What this means is, if you want to hide your story from competitors or existing customers who don’t need to see your marketing material, Instagram allows you to list users you don’t want to show your content to. Finally, Instagram stories are a great way to test content. If your story generates a lot of buzz, you can turn it into an evergreen Instagram post by simply choosing the option “share as post”. On the other hand, if your Instagram story doesn’t generate the buzz you thought it would, then you can simply create several Instagram stories and test which ones worked best. In order to create your own Instagram story, simply click on the home tab on Instagram, and click on “your story” at the top left hand corner. Then, you’ll have the option to either record a live video or take a picture or record a video. 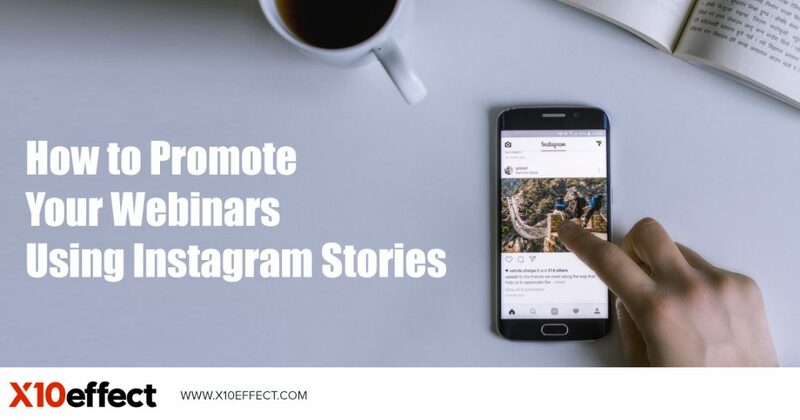 There are many ways you can use Instagram stories to promote your webinar. One strategy, would be to upload a picture as a teaser for your webinar. For example, if your webinar is about weight loss, you could share a before and after picture of you or someone else you’ve helped lose weight with text overlay saying “New webinar reveals how I lost 5 kilos in 30 days without dieting”. Alternatively, if your webinar was about how to sell on eBay, your story could be a screenshot of sales you’ve generated on eBay with text overlay saying: “Free webinar reveals how I make $60 a day thanks to eBay”. Your story to promote your webinar doesn’t have to stop at a single photo. It could be a series of photos acting as a teaser for your webinar. For example, you could display several screenshots back to back, or several before and after pictures back to back, or the first few slides of your webinar. Another way of promoting your webinar through Instagram stories is by creating a short story. For example, should you have a case study of a successful customer of yours, turn it into an Instagram story. Simply upload several pictures of your customer, with the first picture being how they started their journey and the last picture being where they are today thanks to what you teach on your webinar. Alternatively, your Instagram story could simply be an announcement, either through the use of video where you simply say “Hey, I’ll be running a live webinar, this Thursday, at 8pm EST all about how you can become an Amazon number 1 bestselling author in 5 steps – registration link in the bio”. Your Instagram story could also be a testimonial from one of your customers, inviting people to attend your webinar. The testimonial could either be an interesting, fun and eye-catching picture with text overlay about their positive experience with you and a call to action to watch your webinar. Alternatively, it could simply be a video testimonial from a happy customer encouraging your followers to watch your webinar. Remember when posting Instagram stories, to publish them at optimal times, when your followers are most likely to be on Instagram. Tracking tools such as Iconosquare will help you discover those specific times and days of the week. Great info – thanks! Never heard of Iconosquare – now another spend but a great tool if you are serious! Cheers Helen. We appreciate your comments. under nervous tension stress, I just wanted to find just out what’s going on here? Good Content ! Awesome !